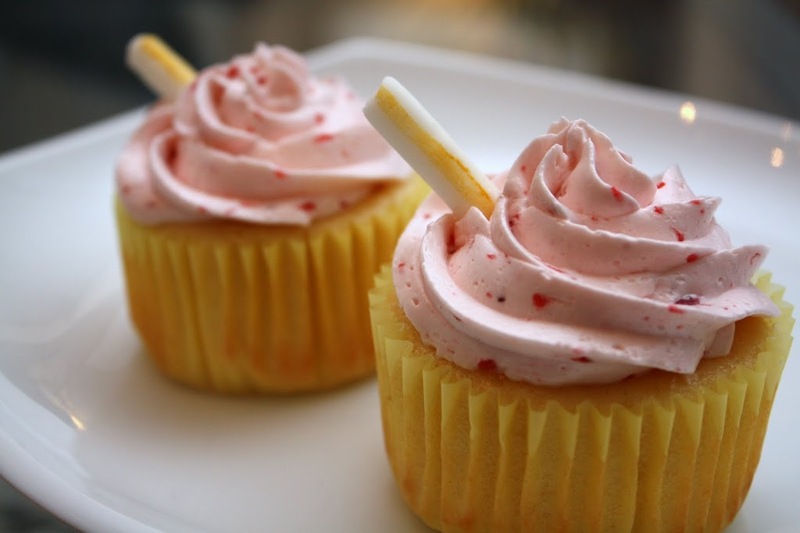 Strawberry Lemonade Cupcakes – Summer is Here! My brother and his wife’s garden overfloweth with fresh fruit, so we took a load of lemons off their hands. Most of them went toward fresh lemonade (with many packets of Truvia and Splenda), but of course a few had to be saved for cupcakes. These lemon cupcakes are topped with fresh strawberry Swiss meringue buttercream to welcome summer! Last year, summer decided to not show up in San Diego, so I am celebrating the warm sunny days we are finally getting this year. The cupcakes are made especially lemony with the addition of limoncello and lemon oil. The straws are made with rolled fondant painted with gold dusting powder. Note to self: Do not cover overnight or the straws will wilt . . .